Diabetes mellitus type 2 is typically a chronic, adult-onset disease that is caused when production of the hormone insulin is inadequate or the body becomes insensitive to it. Insulin is needed to transport dietary glucose from the blood into the body cells, where it is stored or converted to energy. 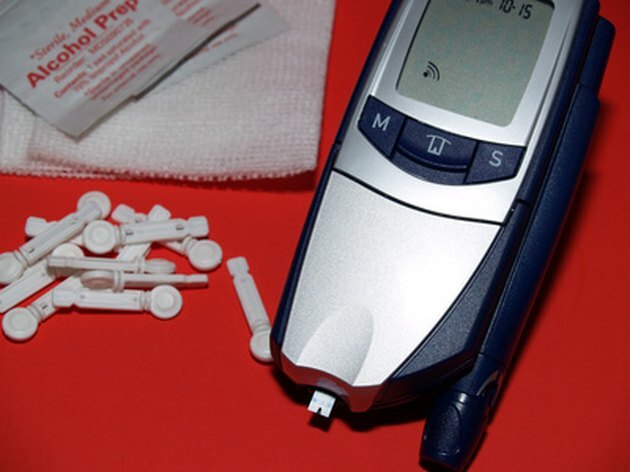 Symptoms and blood tests are used in the diagnosis of diabetes. The University of Washington School of Medicine notes that some of the characteristic symptoms of diabetes may be caused by other diseases. Diabetes causes severe fatigue, weakness and tiredness, because the body's metabolism is affected by the inability of glucose to be transported into the body's tissues. Anemia is a blood disorder with the same symptoms of weakness and fatigue. Metabolism and energy levels are affected in the patient with anemia, because the body cannot effectively transport oxygen to the cells. Anemia is caused by insufficient amounts of erythrocytes or red blood cells, which contain the oxygen-binding protein hemoglobin. The University of Maryland Medical Center notes several types of anemia. The most common is caused by inadequate iron in the diet. Diabetics may develop vision problems, such as dryness, blurred vision, weakened eyesight and even blindness due to complications such as diabetic retinopathy. Diabetic retinopathy occurs when the blood vessels to the retina of the eye become narrowed and hardened from the chronic levels of high glucose in the blood. Atherosclerosis is a disease that causes similar vision symptoms. With atherosclerosis, the arteries also become hardened, narrowed and clogged, decreasing the flow of life-giving blood to the eyes and other areas of the body. Atherosclerosis is caused by high levels of fat, lipids and cholesterol in the blood. This results in plaque buildup in the arteries and an increased risk of blood clots forming -- possibly leading to cardiovascular disease. Diabetes may cause diabetic neuropathy, a condition in which the nerves become damaged due to decreased circulation in blood vessels of the limbs. Neuropathy involves symptoms of tingling or numbness in the hands, feet and lower limbs and decreased sensation and pain in these areas. Raynaud's disease or Raynaud's phenomenon is a disorder of the circulatory system that also affects the supply of blood to the limbs, hands and feet. The University of Maryland Medical Center notes that this occurs because the small blood vessels or capillaries in the fingers and toes temporarily narrow due to stress and cold temperatures, causing similar symptoms to diabetic neuropathy. Why Do Diabetics Have Bad Circulation?